My daughters love fruit rollups from the store. Aside from the garish colors and blast of sugar, I am okay with buying them every now and then. Then I saw a recipe on…Pinterest! (Where else?) I decided to give the homemade version a try. My youngest assisted me in the kitchen and had fun making them, but when it came time to take a bite she hesitated. I tried one and was surprised at how similar the taste was compared to the store bought version. She proceeded with caution, took a smile bite and immediately spit it out. Maybe it’s the seeds? My oldest one was excited to try them when she got home from school and sadly, she gave it a thumbs down too. I think they make a great portable snack. In retrospect, I should have offered them after their evening swim lessons when they will eat anything. Oh well, I think they taste great so more for me. You could try this recipe with your kids and probably have better luck. It’s simple to make. Spring break isn’t far away and this would be a perfect way to sneak in some science. 1. Place strawberries into a food processor or blender and puree until smooth. 2. 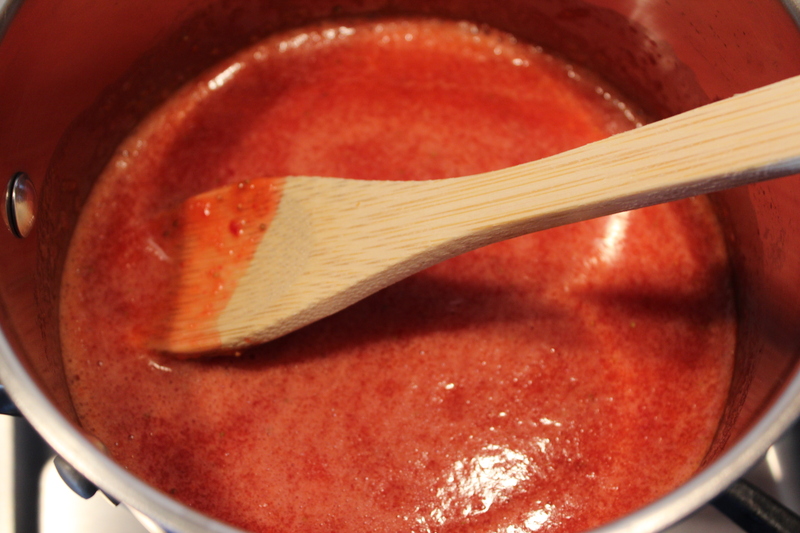 Transfer strawberry puree to a saucepan. Add lemon juice and sugar. Turn heat on stove to medium and cook for about 10 minutes until sauce begins to thicken. 3. Preheat oven to 170 degrees. Line a rimmed baking sheet with parchment paper. Pour strawberry mixture over paper and use an offset spatula or knife to smooth out into a rectangular shape. 4. Bake in the oven for about 3 1/2 to 4 hours. You want the middle to be slightly tacky, but you don’t want the entire rollup to be crisp and cracking. The sides might crack a little though and that’s fine. 5. 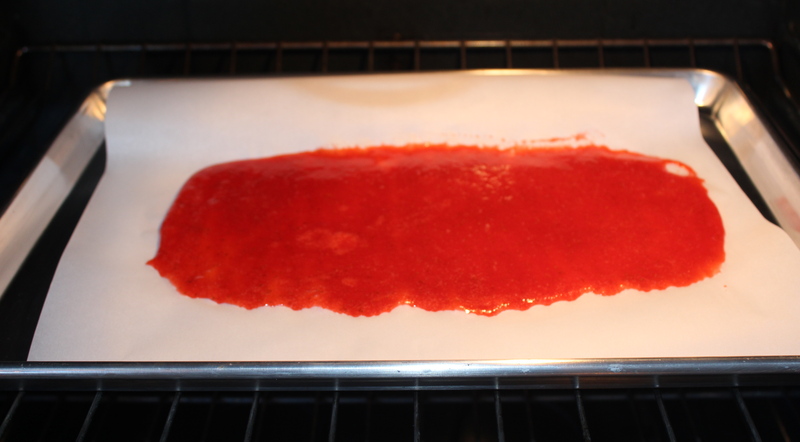 Remove fruit leather from oven and cool for about 10 minutes. 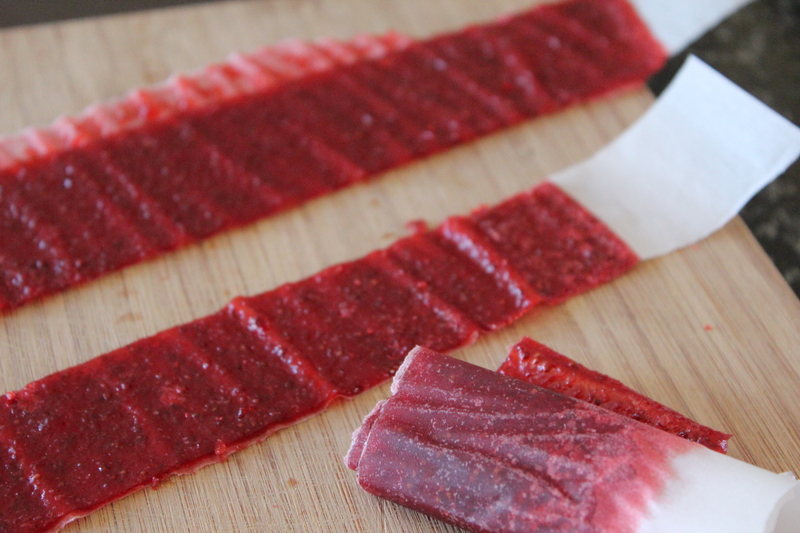 Use a pizza cutter to cut strips and roll ’em up! Enjoy. The start of cooking the strawberry mixture. Still needs to thicken. The rectangular shape can be a bit misshapen. It gives it more of a rustic, homemade look.